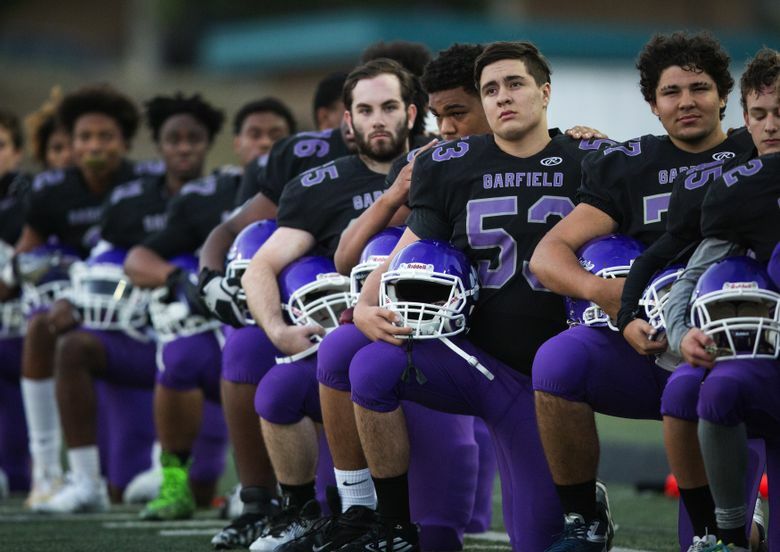 A few questions with Jelani Howard, who led the Garfield football team when it decided to kneel during the national anthem last fall. Howard was one of four Seattle high school students who won the Black Education Matters Activist Award. After he and his teammates on Garfield High’s football team decided to kneel during the national anthem at their games this past school year, Jelani Howard wasn’t expecting the action to have much of an effect. But it did — with other area schools also kneeling to raise awareness about racism and police brutality, and national media outlets running stories about it. “It really affected people and showed that kids can actually make a difference in the world,” he said. Howard, 18, was one of three Seattle high school students who recently won Black Education Matters Activist Awards, created by Garfield teacher Jesse Hagopian. Each winner received $1,000, which Hagopian funded from the financial settlement he received from the city of Seattle after he was pepper sprayed by a police officer at a Martin Luther King Day rally in 2015. The other winners are Precious Manning-Isabell, who graduated from Chief Sealth International High School, and Bailey Adams, from Garfield. At the awards ceremony, Seahawks player Michael Bennett also presented a similar award — the Pennie Bennett Black Education Matters Award — to Mahala Provost, who also graduated from Sealth. Bennett contributed to Hagopians’ scholarship fund and named the award for his mother, a school administrator and teacher. The Seattle Times Education Lab spoke with Howard about the award, his team’s decision to kneel and what he learned from the experience. Q: The Garfield football team first knelt in September and then decided to continue the protest at later games. What led you and the team to make that decision? A: What we saw going on in America was bad. We knew before Colin Kaepernick (the San Francisco 49ers quarterback who knelt during the national anthem) that what was going on was not right for minorities. It showed that we wanted to make a change in the world. Q: What was it like to express a political opinion during a high-school football game? A: You saw our whole team do it, not just our team, but cheerleaders, some parents started sitting down, our volleyball team, and others started doing it around Seattle schools. It was crazy. It was kind of shocking, going through the experience. I had never been on CBS, I had never been on prime time. No 17-year-old gets to be interviewed by CBS for trying to make a change in the world. Being in that element is something I’ll never forget. It’s something I’ll tell my kids. A: Even if you are going to try to do something good, there are going to be people who don’t agree with you. And you can’t let them stop you. You should do what you think is right. A: I’m going to Central Washington (University) and probably going on walk-on and play football there. But even when I am in college, I’m going to continue to want to make change.